Let’s face it – we all like to look at hot guys shirtless. Male bodies, the ones owned by individuals who have been working out incessantly, deserve to be shown off. What better place to do than on a tropical island in the middle of paradise. Perhaps this is why island vacations are becoming increasingly popular amongst today’s gay traveler, and for good reason. Such a holiday gives you a bit of everything. For those that live in a cold climate, the islands are a much needed ray of sunshine in what is any otherwise dull and dreary climate. Sun filled days is just what the doctor ordered, and spending them with a few thousand other gorgeous guys is certainly an added bonus! Beyond that, there are bars and discos by night, dances on the beach, jungles to explore, and the list goes on. Perhaps you have never been on an island getaway, or you are looking for some fresh ideas to spark those creative juices and motivate you to get those rock hard abs you have been planning on. Whatever the reason, here is a list of the 3 must see islands for today’s gay traveler. The Caribbean Islands – Ok, you got me. The first ‘island’ on our list is actually a group of islands off the Caribbean. These are some exotic destinations that provide stunning natural beauty, along with some of the most chiseled and defined male specimens ever created! Not all islands in the region are created equal for gay travelers, however, as some are still trapped in a culture of homophobia. These heavenly islands lure their visitors with spectacular sandy beaches and clear, turquoise waters. Year-round, the weather is almost perfect here; except for the early-fall hurricane season. However, this should not influence anyone's gay travel plans for 2013, especially since August and September are the best months for a trip to the Caribbean. Some of the beautiful islands are gay-friendlyer than others. Although I’ve never experienced an issue, in general, gay people are not advised to travel to Barbados, Jamaica and the Cayman Islands, as these areas are known for their consistent history of homophobia, as the US Government warns us on http://travel.us.state.gov. Instead, the Dutch, French and US Caribbean Islands are open arms to gay tourists. The island of St. Croix is, without any doubt whatsoever, the most gay-friendly island in the Caribbean. Gay travelers can enjoy all the major benefits of a major tourist destination, such as luxurious resorts, exclusive shopping areas and exquisite restaurants. On the other hand, St. Croix also offers the possibility of spending a relaxing and quiet time alone or with your loved one by the sea. Gay Out recommends the Sand Castle on the Beach Hotel, which is both gay owned and operated. Aside from 21 beautiful and spacious rooms, the hotel offers a beachfront, luxury villa. The rates for this unique villa start at $3071 for 5 days but often run specials offering VIP perks and extra amenities. Phuket, Thailand – Thai destinations seem to commonly make any best of list when it comes to gay travel, and for good reason. There is much to see and do on Phuket, and gays are free to be themselves thanks to the welcoming climate and culture afforded by the Land of Smiles. This is the largest and most famous island in Thailand. The capital city of the country - Bangkok - is only a one-hour flight away. Phuket is known as one of the most gay-friendly places on the globe and its annual Gay Festival takes place twice a year - in February and November. Gay Times Magazine consistently ranks Phuket as a top gay hideaway. The island is famous for its gay nightlife, as Patong - the island's most popular resort town - has the only gathering of gay bars and clubs to the South of Bangkok. Gay Out recommends the La Flora Hotel. This 5 star hotel is only a few minutes away from the gay section of the main beach in Patong. Rates start at approximately $1100 for a week's stay. Phuket is indeed a tropical paradise, with fantastic beaches and beautiful people. Rio de Janeiro, Brazil – Brazil knows hot to party, and the party seems to last all year long. Join thousands of gays on this island paradise known as Rio and you will never feel alone. This amazing city in Brazil is more than just the place where people can see the world-famous, enormous statue of Jesus called “Christ the Redeemer”. As a matter of fact, Rio is one of the most preferred gay travel destinations in the world. The unique beauty of Rio lies in its fabulous beaches, most of which are very popular with gay tourists. 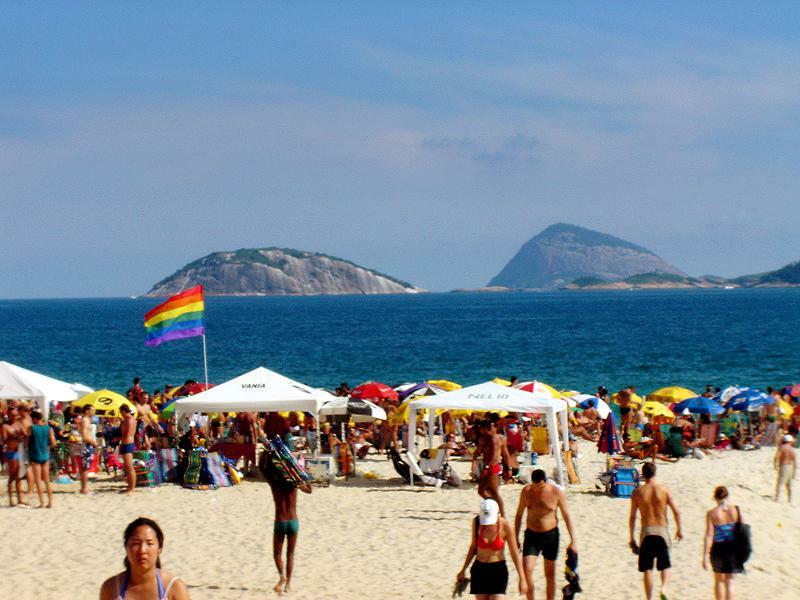 In addition, the city is renowned for its gay-only beach: Ipanema. The beach is part of the city's gay area, which happens to go by the same name. For gay travel groups that are looking for fun and continuous partying, complete with half-naked gay men everywhere, the Leblon district in Rio de Janeiro is the place to be. Although Rio continues to be highly popular among gay tourists, it’s not the ideal choice if a romantic and/or relaxing vacation is what you dream about. Gay Out would recommend splurging a bit and opting for the Sofitel Rio de Janeiro Copacabana Hotel. Rates start at approximately $350 a night, but they vary greatly, depending on the type of room or suite that the guests choose. An important aspect is that the hotel does not offer any single rooms. As a consequence, a so-called single supplement is charged upon booking a room or a suite. Late August is the best time to visit Rio de Janeiro so contact a Vacation Side Travel Consultant soon if you want to experience all that Rio has to offer. So, break out that swim suit, hit the gym a few more times, and get out there to enjoy all that these islands hold in store for today’s gay traveler. The most difficult part of your tip will most definitely be the return trip home!